New technology in digital imaging, tooth colored crowns and fillings, root canal treatments, periodontal and oral surgeries, implants, grafting and restorative treatments help make our patients' visits more comfortable and effective. Patients have electronic charts which enable immediate information access and integration. Treatment is coordinated more readily and insurance forms are filed through E-claims more efficiently. This charting method also dramatically reduces paper usage. can be precisely located. This powerful 3D image can also help the dentists diagnose periodontal disease and anatomical defects. 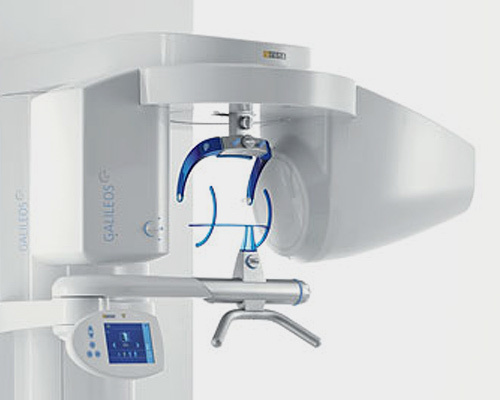 The GALILEOS 3D X-ray scan takes only 14 seconds. With a patient exposure time of two to six seconds, the pulsed imaging technology leads to a low radiation dose. The GALILEOS reconstruction program calculates the entire image volume from the data of the 200 individual exposures that are generated with a pulsed scan. After a total of seven minutes the image appears on the screen and is ready for comprehensive diagnostics. entire process in about 2 hours from start to finish - all in one appointment! No impressions, no temporaries and no return appointments two weeks later. is enriched with platelets. PRP is a concentrated source of autologous platelets. These cells contain and release several different growth factors (cytokines) which stimulate healing of bone and soft tissues, resulting in more effective and rapid healing. the surgical placement of implants to the aesthetic and functional restorations can be completed in our office.